DrainJet is a small family business that was set up in 2006 which is owned and operated by Geoff White a licensed plumber, and Rhiannon Ross. 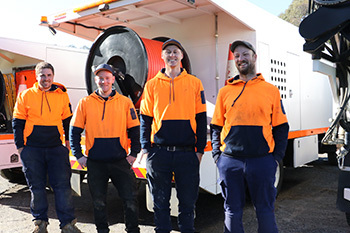 We have several drain cleaning and CCTV units and our employees are skilled, intelligent operators with years of experience and can solve even the hardest drain cleaning issues. All our trucks are unmarked with no signwriting, we have no logos on our work uniforms and we never hand out business cards on our customers jobs. We are not a large national or multinational company and are not ashamed of this, we believe it allows us to perform our job with honesty, integrity and have pride in the quality of our workmanship. It also allows us to provide a level of service and attention to detail that the larger companies cannot compete with, when you book a truck you will be speaking directly to Geoff the business owner, not an office manager or sales person who has never cleaned a drain in their life.